Deep dish pizza and hot dogs. For a city known for its gluten delights, I knew we had our work cut out for us when we decided to break free of VRBO and AirBNB, be celiac rebels and stay in a…gasp…hotel. The thought of not having our own kitchen where I could confidently provide our daughter with celiac disease ( age 11) with safe meals made me worried I would end up like a teenager who excitedly borrowed the family car for the first time for an epic night out on the town only to find out half way there that the gas tank was empty and she forgot her wallet at home – stuck, out of luck and in need of help! What was I thinking?! To kick that feeling, I, like most of you would, researched and researched and researched until the sound of my fingers tapping on the keyboard became a tune I found myself humming to. Thanks to www.glutenfreebetsy.com and www.findmeglutenfree.com I found lists and lists of safe places to eat. I click, click, clicked my way to thinking that perhaps we could actually visit this city and perhaps, just maybe, we could have a vacation that didn’t include cooking every day and planning outings based on where we could purchase GF products and when we could get back to our rental for dinner. As much as that irresponsible feeling was still gnawing at me, I threw my reliable friend, Caution, out the window and we booked it. Worst case: we survive on GF bread and peanut butter (luckily no nut allergies for us, just celiac and T1D) for five days. We could do it. So, how did it go? Overall – it worked – with one close call. I’ll touch on that later; for now let’s get to where to stay, where to go and most importantly, where to eat! We stayed at the Intercontinental Hotel on the Miracle Mile, central to everything, and easy access to transportation. I spoke to the hotel food & beverage department before booking and I was told they could accommodate us for breakfast and dinner. And accommodate they did – they managed to safely feed out “palate limited” (read: picky) daughter a plate of eggs and fruit, GF toast and muffins one morning and GF pasta cooked in separate water one evening after a long day in the windy city. Venturing outside our hotel required us to be well armed with Udi’s bread and peanut butter along with a heavy backpack full of GF granola bars and snacks and of course, the trusty “Find me GF” app. If you haven’t tried it, it’s worth the download. It helps you locate restaurants relative to where you are that either provide GF options or have a GF menu. It’s a huge help but only a place to start. As always, this comes with a warning. I’m sure you have found, like we have, that restaurants with GF options aren’t necessarily safe for people with celiac disease. The item itself may not contain gluten but it may have been prepared on the same surface a gluten sandwich was just cut on. That’s not going to work! It’s always worth a call before hand or a chat with the chef upon arrival. With our 13 and 11 year old, we thought it was best to start off with the classic city hop on and hop off bus tour to get an overview of this gorgeous city. Highly recommended! We got the pass that covered a few days so that we didn’t miss a thing. A visit to Navy Pier, although very touristy, was fun. 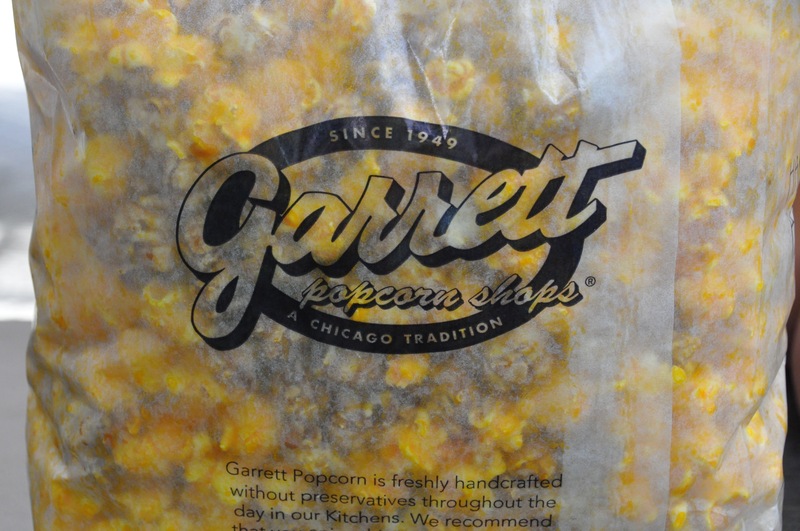 We tried the famous Garrett popcorn (GF) and walked around the pier. We also visited Lincoln Park Zoo, a free zoo just outside the heart of the city (we walked from the hop on, hop off bus stop). It had a surprising selection of animals (although in some in small concrete enclosures…that’s a whole other topic!) and I noticed that their food concessions had some packaged GF items like cookies and sweet squares but no meal options so we didn’t dine at the zoo. The Patio at Café Brauer appears to be the only dining option with GF choices. Shedd Aquarium was a full day affair and had a huge array of sea animals. If you’ve got kids, this should definitely be on your list. I admit that we had our lunch with us so I didn’t go searching for GF alternatives here. I noticed many families had their own snacks and lunches with them. If you are daring, definitely take in the Skydeck at Willis Tower. It’s a 4 ft glass box that extends from the side of the building 103 floors up or 1,353 feet from the ground. My legs instantly turned to liquid jello and I couldn’t even take a photo of the kids there let alone venture up close to it. No need to talk about food here, if you are anything like me, you will feel rather nauseous just thinking about it. Architectural tour on the river — not to be missed! 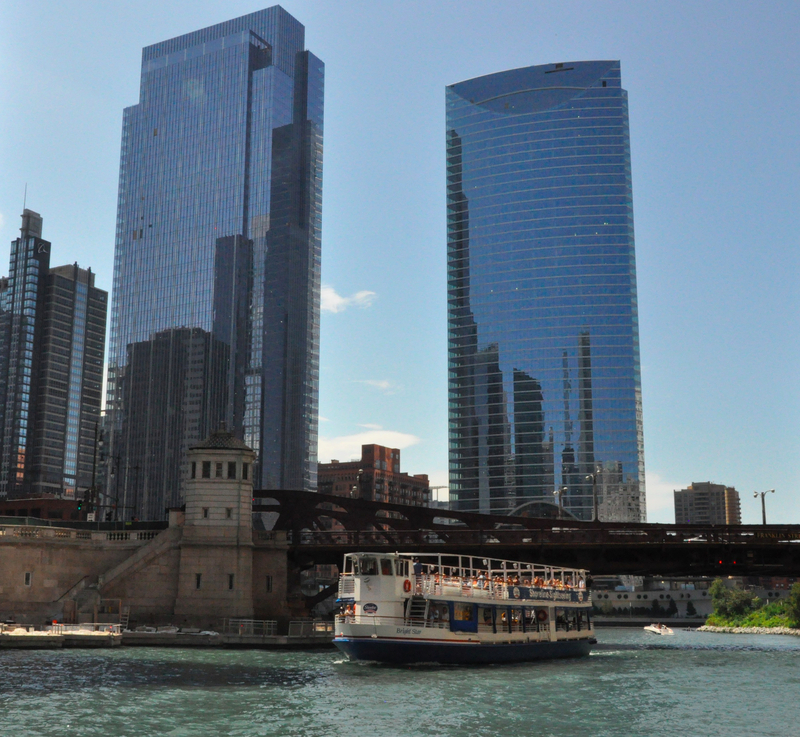 An architectural city tour on the river is a must! Upon advice from the concierge, we took the “Chicago Line” tour run by the Chicago History Museum. It was 90 minutes and our tour guide was simply outstanding. Her knowledge about the history of Chicago and its architecture was endless. They also had GF cookies on board which was such a lovely surprise although our daughter didn’t have any as they were lined up next to the gluten cookies. Perhaps OK for those with gluten intolerance? Apart from these highlights, you just shouldn’t go to Chicago without taking in a baseball game! Although we really wanted to see the Cubs play, they weren’t in town so we went to US Cellular Field to take in a White Sox game. Surprisingly, the stadium was well set up to accommodate our celiac needs. Beggars Pizza brings in pre-packaged GF crusts on its own foil tray from a GF facility. They do add their own ingredients on top however they change their gloves, etc, and seem to have a good protocol. We were surprised to find that if you visit section 124/125 and mention that you are celiac, they send a dedicated allergy specialist out to meet with you and discuss your needs. We were able to have French fries that were cooked in a separate fryer and the entire process was overseen by our allergy specialist. Apparently they have a long list of GF options there. We were impressed! Although not a tourist highlight, another stop high on your list should be Do-Rite Donuts. 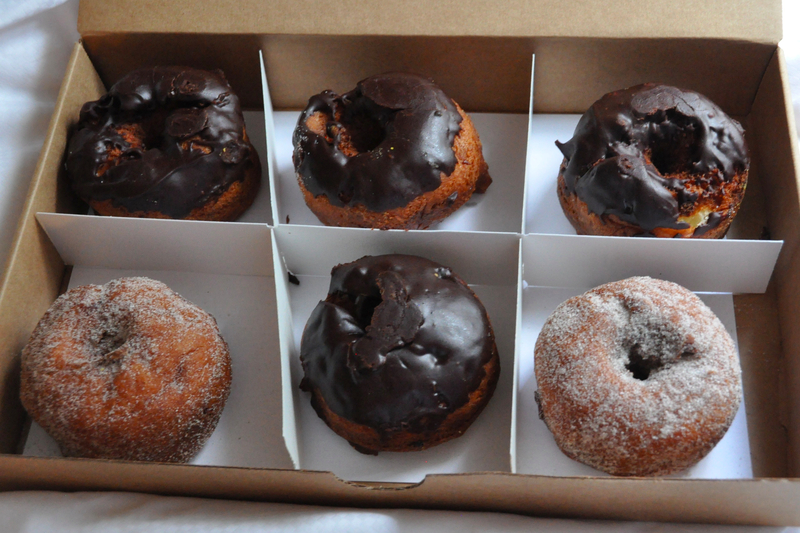 If you have celiac, chances are you haven’t had a really good donut in a long time. This place should be top of your list! Warning – this is not a GF facility, however, they have a separate fryer and separate preparation area for their GF donuts. Since we left my good friend, Caution, at home, we decided to give it whirl. Walking distance from our hotel, my husband got there at 7:00 (it opens at 6:30am weekdays and 7:00am weekends and we read that there is always a line up) in the morning and got the last box of GF donuts. They make 36 at a time so we were lucky. And the taste? As AMAZING as the smile on our daughter’s face. And like all others before us, she didn’t have any stomach issues at all. Check out these bad boys (chocolate, sugar and pistachio)….bad but oh so good. One night we grabbed veggies, hummus, crackers, cheese, fruit and our GF bread and had a picnic dinner which was lovely. We also hit a restaurant called Hub 51 that was walking distance, albeit about a 40-minute walk, from our hotel. They completely understood celiac and all of the necessary precautions and had a decent GF menu. Not being a salad connoisseur, my daughter had fish tacos on corn tortillas and really enjoyed it (which interestingly wasn’t listed on the GF menu). We also tried an Italian restaurant about 30 minutes walking distance from our hotel called Quartino. It was really fantastic. Without being asked the waiter brought us a plate of rice crackers instead of bread to our table. He confidently explained our options and the associated protocol and was very specific in confirming all of that when he brought her meal. The food was delicious, the service was excellent and we really enjoyed the family-style plating and experience. Well worth the visit. We did source a spot to try Chicago’s famous deep-dish pizza – Chicago’s Pizza – highly rated as having the best deep dish GF pizza in the city. Unfortunately, we ran out of time and honestly, after eating out for over a week, we were lacking in desire for another cheesy, carb-loaded meal! Next time Chicago, next time! If you visit Chicago and try it out, please let us know how it is. As you know, eating in any restaurant, unless it is entirely GF, comes with risk. We had a close call at a restaurant that won’t go un-named – Labriola – right on the Miracle Mile. It is an Italian restaurant listed on the Find Me Gluten Free app. We popped in for some take out gluten-free pasta only to discover, after much prodding and apparent rudeness (which was evident from the eye rolling by the server), we discovered that their gf pasta is cooked in the same water as their gluten counterpart. Sadly, this fact was only discovered after the server said “umm, I’m pretty sure it’s cooked separately so it should be fine.” How horrific it would have been had we not pushed her to confirm with the chef. Another lesson in how important self-advocacy is. Overall our first trip without the usual self-catered uber A-type meal planning was a hit. As much as it was slightly nerve-racking and we had to plan our days around where we could safely eat, we had a ton of fun. It did, however, hit the bank account harder than when we rent an apartment and make our own food but it really felt like a complete vacation. Next time, we have decided it would be much easier if we could leave both caution AND celiac disease at home together. They could entertain each other! Wouldn’t that be a treat?! Have you ever taken the plunge and successfully enjoyed a trip away without cooking every night? If so, please share your experience, we’d love to hear from you.